At this event, Princeton University professor Maurizio Viroli challenged popular opinion labelling Nicolo Machiavelli, the author of The Prince (a primer in realpolitik), as an anti-Christian writer and argued that Machiavelli's approach to religion was much more complex than we realize. 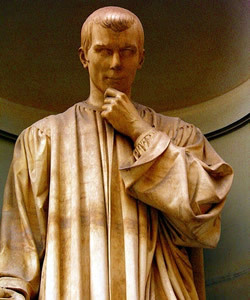 While Machiavelli's works have been criticized by Church authorities through the ages as immoral and heretical, and he was an outspoken critic of the Roman Catholic Church, Machiavelli was not an atheist. Evidence suggests that he believed in the Christian God, albeit in an unorthodox way. For Machiavelli, the republic was the highest good, and shared beliefs in a moral order served to underpin peaceful and productive municipal life. Religion, understood as a shared way of life that might reinforce civic harmony, in Florence or elsewhere, was not necessarily an enemy of freedom or justice.